Celebrating over 35 Years of Model Railroading in the Northern Shenandoah Valley!! In 1982 a small group of model railroad hobby enthusiasts joined together to form the Winchester Model Railroad Club. Their goal was to mutually pursue what would become referred to as the "Greatest Hobby in the World". This website contains a brief history of what that 35 year pursuit has accomplished, from its original formation to the building of its current layout today, and to invite any of you … from the die-hard model railroad hobbyist who has been unaware of the Club's existence to the eager amateur that might just be thinking of constructing your first layout … to come and join us!! •Business meeting on the 1st Tuesday each month. •Work session on the 2nd Tuesday each month. •Open running on the 3rd Tuesday each month. •Operating session on the 4th Tuesday each month. We are not holding open houses while we rebuild our layout in a new location. •Second Saturday of March from 10 a.m. to 1 p.m.
•Second Saturday of November from 10 a.m. to 1 p.m.
•Last 2 Sundays before Christmas from 1 p.m. to 4 p.m.
•December 31 (First Night Winchester) from 6 p.m. to 10 p.m.
We are currently searching for a new clubhouse. 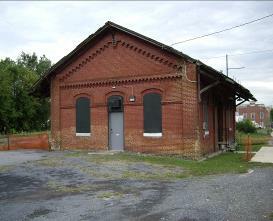 Our Clubhouse was located within the old CSX Freight Building near downtown Winchester VA in the northern Shenandoah Valley. Our mailing address is listed on the Contact page.